Get ready for an event that is truly out of this world! 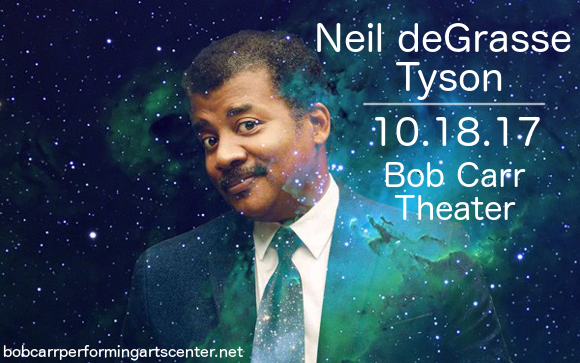 Bob Carr Theater is playing host to the incredible astrophysicist, Neil deGrasse Tyson! Catch this extraordinary show on Wednesday 18th October 2017 – you'll be pleased you did! Get your tickets today to guarantee your place! Gaining an interest in astronomy aged 9 after a visit to the Hayden Planetarium, Tyson went on to complete a degree in physics in 1980 at Harvard University. He started to become known to the public for his work in the “Universe,” section of the Natural History magazine. Under the pen name “Marlin, he also went on the answer questions about the universe in Star Date magazine. Now, he’s coming to answer YOUR questions live at the Bob Carr Theater! Don’t miss your chance to unravel the mysteries of space and time live with Neil deGrasse Tyson – book your tickets now, while they last! !